Normally 11.00am-4.00pm last entry 3.45pm. April: Monday 1st April - Sunday 14th April - Open Daily Easter Weekend: Friday 19th - Monday 22nd April May/June: Weekends only until 30th June. Also Monday 27th May. July/August: Daily (though check our Calendar for closures).September: Weekends only. Also open Monday 16th September. Please check our Calendar for events and exceptional closed days. The nearest public toilet is in West Kilbride at the corner of Main Street and Glen Road. It is maintained by the local community. Portencross Castle is situated overlooking the Firth of Clyde near West Kilbride in Ayrshire. It is a scheduled ancient monument, a recognition of its national importance. Click	on our Calendar to see events. Opening times are 11.00am – 4.00pm with last entry at 3.45pm. Admission is free but donations and fund raising help considerably in keeping the castle open, so all visitor donations are gratefully accepted! May/June: Weekends only until 30th June. Also Monday 27th May. July/August: Daily (though check our Calendar for closures). September: Weekends only. Also open Monday 16th September. On occasion, the castle will close for private events. Details of such closures will appear on the News and Events page and on our Calendar. You can also see Forthcoming Events for details. It is possible to arrange access to the castle outwith the normal operating season. Anyone interested in a private visit, group visit or other event should contact Ann on 01294 823799. Click this link to get in touch with us. Thanks to all those who have made the effort to visit us. We look forward to seeing you again in the future. 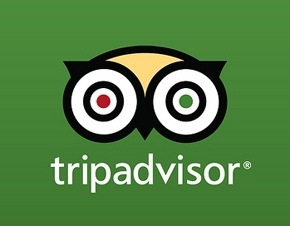 Say what you thought of your visit on TripAdvisor , though please note that Friends of Portencross Castle are not responsible for the municipal car park or any of the land beyond the immediate vicinity of the Castle. The nearest public toilet is in West Kilbride at the corner of Main Street and Glen Road. It is maintained by the local community. 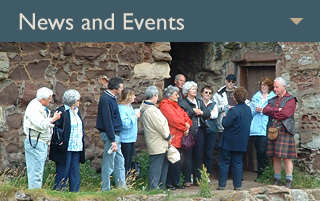 This website has been set up by the Friends of Portencross Castle. 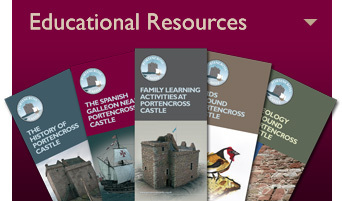 Our aim is to build up a collection of words, images and other media to form an informative and educational online resource containing the history of Portencross Castle, both past and present. You can help us to build this resource. We are looking for anything in connection with Portencross Castle. Perhaps you have a photograph or a poem, maybe an old postcard or a clip of film. If so, we'd love to see it! 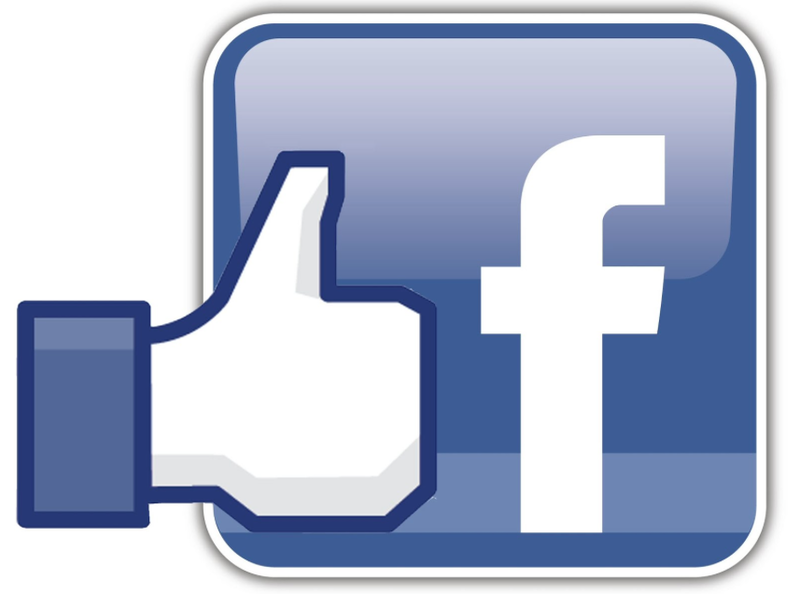 If you have, post it on Facebook or click this link to get in touch. 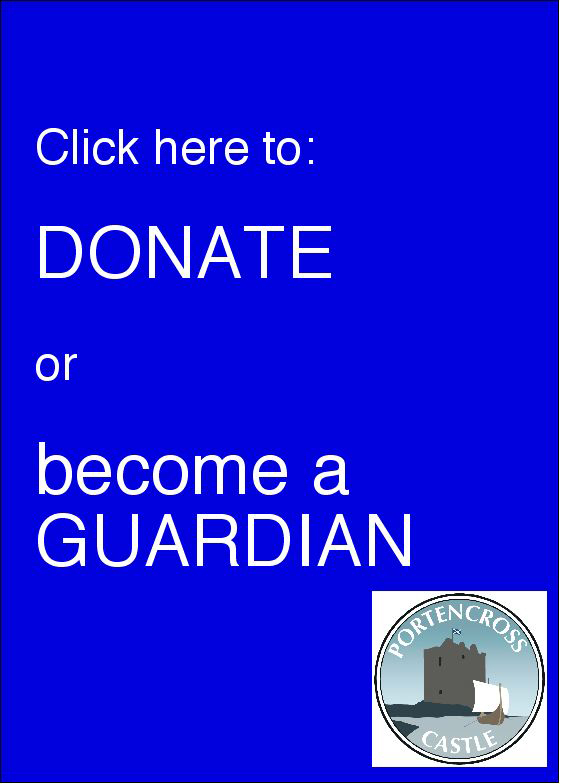 You can see some pictures of Portencross Castle and surrounding area by clicking here. You can also watch an excerpt from the Restoration programme. The area has inspired photographers and artists over the years. John Mason of the Scottish Fiddle Orchestra composed The Flower of Portencross. You can hear it played on guitar by 'Kev'. You can also view poems and pictures by children and parents at West Kilbride Primary School. You can see an aerial fly-over of the castle and its surrounds in this atmospheric video. Portencross has been inhabited for thousands of years. An archaeological dig found evidence of an Iron Age settlement on Auldhill, just behind Portencross Castle. The Iron Age lasted from around 800 BC to 100 BC. Portencross Castle was constructed in three phases starting around 1360. It was the home of a branch of the Boyds. 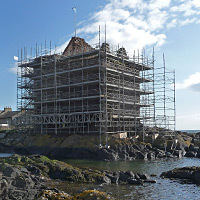 Portencross Castle underwent major building conservation works during 2009 and 2010 all thanks to the fund-raising efforts of the local community of Portencross and through generous donations from various organisations and the public. Read about how it all happened. The lands around Portencross were given to the Boyds of Kilmarnock by King Robert I as a reward for their help at the Battle of Bannockburn. A number of Royal Charters were signed at the castle and it had close links with King Robert II during that period. After the 1600s, it was occupied by local fishermen. The roof was destroyed in a gale in January 1739. By the 20th century, the Adams of Auchenames owned the castle. It became a scheduled ancient monument in 1955.